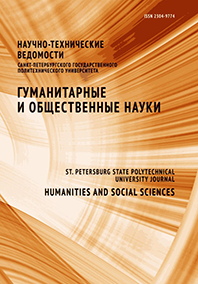 Tanova Anna G. Evseeva Lidia I. Pozdeeva Elena G. Trostinskaya Irina R.
This article focuses on the results of sociological studies conducted among the Polytechnic University students regarding their satisfaction with the quality of education and whether university students were ready to be a subject of evaluation of different aspects of the educational process. Monitoring the satisfaction with education is based on the feedback system being developed in the university, which takes into account the student’s role as a direct participant and an interested party. Satisfaction with education belongs to the sphere of mutual expectations of all participants, which makes analysis of the styles of behavior of university teachers and students all the more important. The quality of education is regarded both as a dynamic process of constructive interaction and as a phenomenon with a system of elements to study with measurable indicators. Monitoring the integrated assessment shows the process of needs and expectations meeting in the sphere of educational environment development. The survey conducted demonstrates a rather high level of satisfaction with education that corresponds to other universities’ monitoring data. The practice-oriented aspects of education are considered to be one the most important indicators of insufficient satisfaction with education. The survey shows that students are not ready enough to assess the quality of education and that they are not sufficiently aware of the future transformations and new opportunities. The results obtained could be a basis for improving the university’s educational politics and the information support technologies of the educational process. This paper is recommended for university teachers, researchers, heads of educational programmes.